Surfactant protein-D (SP-D) participates in the innate response to inhaled microorganisms and organic antigens, and contributes to immune and inflammatory regulation within the lung. SP-D is synthesized and secreted by alveolar and bronchiolar epithelial cells, but is also expressed by epithelial cells lining various exocrine ducts and the mucosa of the gastrointestinal and genitourinary tracts. SP-D, a collagenous calcium-dependent lectin (or collectin), binds to surface glycoconjugates expressed by a wide variety of microorganisms, and to oligosaccharides associated with the surface of various complex organic antigens. SP-D also specifically interacts with glycoconjugates and other molecules expressed on the surface of macrophages, neutrophils, and lymphocytes. In addition, SP-D binds to specific surfactant-associated lipids and can influence the organization of lipid mixtures containing phosphatidylinositol in vitro. Consistent with these diverse in vitro activities is the observation that SP-D-deficient transgenic mice show abnormal accumulations of surfactant lipids, and respond abnormally to challenge with respiratory viruses and bacterial lipopolysaccharides. The phenotype of macrophages isolated from the lungs of SP-D-deficient mice is altered, and there is circumstantial evidence that abnormal oxidant metabolism and/or increased metalloproteinase expression contributes to the development of emphysema. The expression of SP-D is increased in response to many forms of lung injury, and deficient accumulation of appropriately oligomerized SP-D might contribute to the pathogenesis of a variety of human lung diseases. Surfactant protein-D (SP-D) is a member of the collagenous subfamily of calcium-dependent lectins (collectins) that includes pulmonary surfactant protein A (SP-A) and the serum mannose-binding lectin [1–3]. Collectins interact with a wide variety of microorganisms, lipids, and organic particulate antigens, and can modulate the function of immune effector cells and their responses to these ligands. This article reviews what is currently known about the sites of production, structure, function, and regulated expression of SP-D. Emphasis will be placed on functional attributes, known ligand interactions, and structure-function relationships believed to be important for host defense. For additional information on SP-A and other members of the collectin family, the reader is referred to other recent reviews [4–6]. SP-D is synthesized and secreted into the airspaces of the lung by the respiratory epithelium . At the alveolar level, SP-D is constitutively synthesized and secreted by alveolar type II cells. More proximally in the lung, SP-D is secreted by a subset of bronchiolar epithelial cells, the non-ciliated Clara cells. Because SP-D is stored within the secretory granules of Clara cells [7,8], it seems likely that SP-D is subject to regulated secretion via granule exocytosis at this level of the respiratory tract. In some species, SP-D is also synthesized by epithelial cells and/or submucosal glands associated with the bronchi and trachea . Although many alveolar macrophages show strong cytoplasmic and/or membrane labeling with antibody against SP-D, they do not contain detectable SP-D message. The lung seems to be the major site of SP-D production. However, there is increasing evidence for extrapulmonary sites of expression as assessed with monoclonal or affinity-purified antibodies, reverse-transcriptase-mediated PCR (RT-PCR), and/or hybridization assays of tissues from humans and other large mammals [10–14] (summarized in Table 1). It is difficult to entirely exclude cross-reactions or amplification of related sequences; however, localization to many of these sites in human tissues was confirmed by using monoclonal antibodies in combination with RT-PCR with sequencing of the amplified products . Non-pulmonary expression seems to be largely restricted to cells lining epithelial surfaces or ducts and certain glandular epithelial cells that are in direct or indirect continuity with the environment. Notable exceptions to this generalization might include heart, brain, pancreatic islets, and testicular Leydig cells. SP-D has also been identified in amnionic epithelial cells by immunohistochemistry ; however, it is unclear whether this is synthesized locally or derived from the lung by way of the amniotic fluid. Interestingly, in many of these sites SP-D microscopically co-localizes with gp-340, an SP-D binding protein and putative SP-D receptor . Sites of extrapulmonary expression have also been described in small mammals. In the rat, SP-D message was identified in RNA extracted from skin and blood vessel , and both protein and message were identified in gastric mucosa  and mesentery . Using RT-PCR, SP-D message has also been identified in mouse stomach, heart, and kidney . SP-D (43 kDa, reduced) consists of at least four discrete structural domains: a short, N-terminal domain; a relatively long collagenous domain, a short amphipathic connecting peptide or coiled-coil neck domain, and a C-terminal, C-type lectin carbohydrate recognition domain (CRD). Each molecule consists of trimeric subunits (3 × 43 kDa), which associate at their N-termini (Fig. 1). Although most preparations of SP-D contain a predominance of dodecamers (that is, four trimeric subunits), the proportions of various oligomers vary between species. For example, rat lavage and recombinant rat SP-D are almost exclusively assembled as dodecamers (four trimers), whereas recombinant human SP-D is secreted as trimers, dodecamers and higher-order multimers . SP-D isolated from the lavage of some patients with alveolar proteinosis consists predominantly of higher-order multimers, which can contain up to 32 (or more) trimeric subunits (Fig. 1). Molecular structure of SP-D. (a) Schematic diagram illustrating the structure of SP-D dodecamers, which consist of four trimeric subunits, and SP-D trimers. (b) Quick-freeze deep-etch image of human SP-D dodecamers, SP-D multimers, and the SP-D binding protein gp-340 (kindly provided by John Heuser, Washington University School of Medicine, St Louis, Missouri, USA). Recent crystallographic and mutagenesis studies suggest that the structural determinants of saccharide binding are similar to those originally described for mannose-binding lectin [19–22]. At least two bound calcium ions and two intrachain disulfide crosslinks stabilize the required tertiary structure, and Glu321 and Asn323 within the CRD participate in glucose/mannose type recognition. Interactions with at least one glycolipid ligand, phosphatidylinositol (PI), require the participation of the C-terminal end of the protein [23,24]. A trimeric cluster of CRDs is necessary for high-affinity binding to carbohydrate ligands [21,25]. The crystal structure of human SP-D suggests that the spatial distribution of CRDs within a trimeric subunit permits simultaneous and cooperative interactions with two or three glycoconjugates displayed on the surface of a particulate ligand . Furthermore, solid-phase binding studies have shown that monomeric CRDs have an approximately 10-fold lower binding affinity for multivalent ligands than trimeric CRDs. Crystallographic studies of human SP-D further suggest that the spatial organization of CRDs within a trimer is stabilized by interactions of the C-terminal sequence with the trimeric neck domain [21,26]. Interestingly, the three CRDs show a deviation from threefold asymmetry, suggesting some flexibility of the CRDs in relation to the neck. Thus, the dependence of the binding of PI on the C-terminal sequence could reflect conformational effects, rather than the direct participation of this sequence in ligand interactions. The collagen domain length of SP-D is highly conserved and lacks interruptions in the repeating Gly-X-Y sequence(in which X and Y are different amino acids). As for other collagenous proteins, this domain is enriched in imino acids and contains hydroxyproline. Unlike SP-A, SP-D also contains hydroxylysine. Although the collagen domain of rat, human, bovine, and mouse SP-D lacks cysteine residues, cDNA sequencing has identified a codon for cysteine within the collagen domain of pig SP-D ; this suggests the possibility of alternative patterns of chain association and oligomeric assembly for pig SP-D. The first translated exon of SP-D contains a highly conserved and unusually hydrophilic Gly-X-Y sequence that shows little homology with the remainder of the collagen sequence. The functional significance of this region is unknown. However, it has been suggested that this region contributes to oligomer assembly or mediates interactions with cellular receptors. The collagen domain determines the maximal spatial separation of trimeric, C-terminal lectin domains within SP-D molecules, but might also contribute to normal oligomeric assembly and secretion. For example, deletion of the entire collagen domain of rat SP-D results in the secretion of trimers rather than dodecamers . In addition, 2,2-dipyridyl, an inhibitor of prolyl hydroxylation that interferes with the formation of a stable collagen helix, causes the intracellular accumulation of 43 kDa monomers and dimers . In any case, the complete conservation of the number of Gly-X-Y triplets suggests that the spatial separation of trimeric CRDs is critical for normal SP-D function. The N-terminal peptide of the mature protein contains two conserved cysteine residues at positions 15 and 20. These residues participate in interchain disulfide crosslinks that stabilize the trimer, as well as the N-terminal association of four or more trimeric subunits. Stable oligomerization of trimeric subunits permits cooperative or bridging interactions between spatially separated binding sites on the same surface or on different particles. The process of forming interchain disulfide bonds is complex, and appropriate crosslinking of the N-terminal domains might be rate limiting for secretion . Subcellular fractionation studies suggest that interchain bonds form initially between the three chains of a trimeric subunit. Subsequent rearrangements within the rough endoplasmic reticulum might allow the covalent crosslinking of a single chain from one subunit and two crosslinked chains of another, with the associated elimination of free thiol groups. Mutant proteins that contain unpaired N-terminal cysteine residues are not secreted. However, it is unclear whether this results from abnormalities in disulfide bonding itself, or the failure to stabilize the required N-terminal conformation. The collagen domain contains hydroxylysyl-derived glycosides and a single N-linked oligosaccharide. In most species (human, rat, mouse, and cow) the site of N-linked glycosylation is located near the N-terminal end of the collagenous domain. Recently, it was shown that pig SP-D has an additional potential site of N-linked glycosylation within the CRD . Although rat and human lung lavage SP-D seem to be sialylated, as suggested by charge heterogeneity and cleavage with highly purified neuraminidase, preparations of human amniotic fluid and bovine lavage SP-D recovered from amniotic fluid showed predominantly complex type biantennary structures and no sialic acid . A variant form of SP-D (50 kDa) has been identified in lavage from a subset of human lavage samples; this protein shows O-linked glycosylation of threonyl residues within the N-terminal peptide domain . At present, the functional significance of these sugars is not known. The presence of O-linked glycosylation within the N-terminal domain might be predicted to interfere with normal dodecamer assembly. In this regard, the O-glycosylated 50 kDa form of human SP-D is recovered as trimeric subunits or smaller species. As for many glycoproteins, the functional role of the attached carbohydrate is unknown. Mutational analysis has shown that the N-linked sugar on rat SP-D is not required for secretion, for dodecamer formation, or for interactions with a variety of microorganisms [29,33]. Consistent with its designation as a `mannose-type' C-type lectin, SP-D preferentially binds to simple and complex saccharides containing mannose, glucose, or inositol [34,35]. SP-D also interacts with specific constituents of pulmonary surfactant including PI [36–38] and glucosylceramide . Binding to glucosylceramide involves interactions of the carbohydrate-binding sequences of the CRD with the glucosyl moiety. However, the interaction of SP-D with PI involves interactions with the lipid, as well as CRD-dependent interactions with the inositol moiety [24,40]. Microorganisms are surfaced with a diverse and complex array of polysaccharides and glycoconjugates, and most classes of microorganism contain one or more sugars recognized by SP-D. However, the outcome of this interaction depends on the specific organism and can be modified by the conditions of microbial growth. The potential consequences of this interaction include the following: varying degrees of lectin-dependent aggregation (namely, microbial agglutination), enhanced binding of microorganisms or microbial aggregates to their `receptors' on host cells, phagocyte activation, and opsonic enhancement of phagocytosis and killing, potentially involving one or more cellular receptors for SP-D.
SP-D binds to many - if not most - species of Gram-negative bacteria including such important pulmonary pathogens as Pseudomonas aeruginosa, Klebsiella pneumoniae, and Haemophilus influenzae  (Table 2). However, SP-D also binds to certain Gram-positive organisms including strains of Streptococcus pneumoniae and Staphylococcus aureus , and to mycobacteria . Binding to organisms in suspension is often - but not always - accompanied by some degree of aggregation. SP-D binds to purified lipopolysaccharide (LPS) isolated from a variety of Gram-negative organisms [35,41]. In addition, LPS is the major cell wall component that is labeled on lectin blotting of outer membranes isolated from Escherichia coli . The latter interactions involve the recognition of the core oligosaccharide domain, which contains glucose and heptose . SP-D interacts preferentially with purified LPS molecules characterized by short or absent O-antigens and preferentially agglutinates bacterial strains expressing a predominance of rough (O-antigen-deficient) LPS [41,44]. Although the core oligosaccharide domain of LPS constitutes the major ligand for SP-D on at least some Gram-negative bacteria, the mechanism of interaction with this group of microorganisms is probably heterogeneous. SP-D binds to some smooth, unencapsulated strains of Gram-negative bacteria by immunofluorescence. The mechanism is uncertain; the quantity or quality of binding differs from that observed for rough strains and does not necessarily result in agglutination. LPS molecules on the surfaces of bacteria show heterogeneity in the extent of maturation, so it is possible that this interaction is mediated by a subpopulation of LPS with deficient O-antigens and that the density of binding sites is too low for high-affinity binding. The recognition of the surface glycoconjugates on Gram-negative bacteria by SP-D depends not only on the expression of lectin-specific residues by a given strain or species, but also on the accessibility of these residues [1,45]. For example, SP-D binds inefficiently to the core region of LPS of encapsulated Klebsiella, but efficiently agglutinates the corresponding unencapsulated phase variants. Interactions of SP-D with the core oligosaccharides of Gram-negative organisms are also influenced by the number of repeating saccharide units associated with the terminal O-antigen of the LPS [41,44]. Other potential ligands include the O-antigen domain of LPS, certain capsular polysaccharides, and membrane-associated glycoproteins. In this regard, SP-D can bind to di-mannose containing O-antigens expressed by a subset of Klebsiella serotypes (I Ofek, H Sahly and EC Crouch, unpublished data). Although other C-type lectins, specifically SP-A and the mannose receptor, can interact with specific capsular polysaccharides , a specific interaction of SP-D with capsular glycoconjugates or exopolysaccharides has not been described. The mechanism of interaction with Gram-positive organisms has not been elucidated. Lipoteichoic acids, which are the major glycolipids associated with the Gram-positive cell wall, do not detectably compete with LPS for binding to SP-D (I Ofek, A Mesika, M Kalina, Y Keisari, D Chang, D McGregor and EC Crouch, manuscript submitted). In preliminary studies we observed that binding was competed only partly with maltose and/or EDTA, raising the possibility that binding might be more complex than for some Gram-negative organisms. Recently, SP-D was shown to interact with the terminal mannosyl-oligosaccharides of lipoarabinomannan from Mycobacterium tuberculosis . The consequences of binding with regard to host cell function are not always predictable. Opsonization of mucoid strains of P. aeruginosa with rat SP-D enhanced the internalization by alveolar macrophages, and these experiments further suggested the involvement of a cellular receptor for SP-D . Interestingly, the organisms were not detectably aggregated by SP-D. Similarly, human SP-D enhanced the internalization and killing of unencapsulated phase variants of Klebsiella pneumoniae  (I Ofek, A Mesika, M Kalina, Y Keisari, D Chang, D McGregor and EC Crouch, manuscript submitted). However, unlike the situation reported for P. aeruginosa, the organisms showed varying degrees of aggregation; some of the largest aggregates were identified in association with the macrophage membrane, but were not internalized. In other studies, human proteinosis SP-D did not enhance the internalization of E. coli J5, a rough laboratory strain, by rat alveolar macrophages, despite efficient bacterial agglutination . In addition, SP-D inhibited the adherence of Mycobacterium tuberculosis to monocyte-derived macrophages, despite efficient microbial aggregation . Rat and human SP-D enhanced the binding and uptake of E. coli K12, Streptococcus pneumoniae, and Staphylococcus aureus by human neutrophils . However, similar effects were observed when the neutrophils were preincubated with SP-D, and there was only a slight enhancement of uptake when bacteria were incubated with human SP-D and washed before their addition to neutrophils. Notably, the extent of binding and internalization was dependent on the extent of multimerization, with human SP-D multimers demonstrating the highest potency. Differences in cell type, the extent of SP-D multimerization, or differences in size or organization of bacterial aggregates could account for some of the apparent inconsistencies. Although LPS mediates the binding of SP-D to at least some Gram-negative bacteria, SP-D can also bind to specific forms of soluble LPS, particularly `rough' or O-antigen-deficient forms [35,41,44]. Because soluble LPS can modulate a variety of cellular responses and is the key mediator of Gram-negative sepsis, such interactions could have considerable biological significance. Several observations suggest a potential protective role of SP-D in the host response to endotoxin. For example, SP-D can bind to intratracheally instilled LPS in rats, and the resulting complexes are rapidly internalized into lysosomal compartments in alveolar macrophages . In addition, as discussed below, preliminary studies suggest that transgenic mice deficient in SP-D develop more intense inflammation in response to intratracheal challenge with LPS . Of particular interest is the recent observation that SP-D can bind directly to oligosaccharides on sCD14, a soluble form of one component of the LPS receptor complex, and modify its interactions with LPS . Although SP-A can bind to LPS, the interaction is mechanistically different and involves interactions with the lipid A domain, and perhaps saccharides associated with certain O-antigens. Human SP-A, but not SP-D, increases the uptake and deacylation of tritiated E. coli LPS by isolated alveolar macrophages , but the biological significance of this finding is uncertain. SP-D binds in a CRD-dependent manner to gpA (gp-140), a heavily mannosylated glycoprotein associated with the trophozoites and cysts of Pneumocystis carinii . SP-D can also bind to cell wall β-glucans . SP-D binding enhances the association of Pneumocystis carinii with rat alveolar macrophages; however, the bound organisms are not efficiently internalized or killed in vitro . SP-D interacts with most of the clinically important fungal pathogens including Cryptococcus neoformans, Aspergillus fumigatus, and Candida albicans [55–57]. We have also observed binding to clinical isolates of Histoplasma capsulatum and Blastomyces dermatitidis (SF Kuan, S Moser and E Crouch, unpublished data). In all cases reported so far, binding is accompanied by agglutination. In particular, SP-D efficiently agglutinates Aspergillus fumigatus conidia  and Candida albicans . Although SP-D also shows CRD-dependent agglutination of unencapsulated forms of Cryptococcus neoformans, no significant binding to encapsulated organisms was observed . There is still relatively little information on the mechanism of SP-D binding to fungi. However, SP-D shows CRD-dependent binding to the N-linked sugars of specific cell wall glycoproteins, including major glycoprotein allergens, of Aspergillus fumigatus . Because SP-D shows lectin-dependent binding to wild-type Saccharomyces cerevisiae, as well as to mutants with low levels of mannosylphosphate in the cell wall, the interactions probably do not involve N-linked phosphomannan sugars . The observation that SP-D interacts with β-glucans on the surface of Pneumocystis  suggests that these glycoconjugates, which are abundant in the cell walls of true fungi, could serve as ligands for SP-D.
As for bacteria, the effects of SP-D binding on the phagocytic response to fungi are somewhat controversial. Human SP-D enhances the oxidative response to, and internalization and killing of, Aspergillus fumigatus conidia by human alveolar macrophages and blood neutrophils . However, other investigators observed binding of rat and human SP-D to conidia but found no enhancement of internalization by rat alveolar macrophages . Furthermore, rat SP-D inhibits the phagocytosis of Candida albicans by these cells . In the latter study the authors suggested that fungal aggregation inhibits phagocytosis. Interestingly, SP-D binding directly inhibited fungal growth and decreased the outgrowth of pseudohyphae, the invasive form of the fungus, in the absence of phagocytic cells . It is possible that these effects are also secondary to agglutination, possibly as result of nutrient deprivation. Purified rat and human SP-D inhibit the infectivity and hemagglutination activity of influenza A virus (IAV) in vitro . This activity is calcium-dependent, inhibited by carbohydrate ligands, and involves the binding of SP-D to high-mannose oligosaccharides associated with the HA1domain of the hemagglutinin (HA) molecule. Because the high-mannose oligosaccharide on the HA1 domain over-lies the sialic acid-binding pocket (the cell attachment site) of the HA, binding can interfere sterically with HA activity and cellular attachment. SP-D also binds to the neuraminidase of IAV and inhibits neuraminidase enzyme activity . SP-D induces massive aggregation of IAV particles [18,33,61,63]. Viral aggregation is calcium-dependent, inhibited by competing sugars, and directly correlated with the multimerization state of SP-D. Highly multimerized preparations of SP-D are significantly more potent than dodecamers. In particular, minimal agglutination is induced with trimeric CRDs. Massive agglutination of organisms could contribute to lung host defense by promoting airway mucociliary clearance, but it might also influence the internalization by phagocytic cells. SP-D enhances the binding and uptake of IAV by neutrophils [33,61,63], and these effects are highly dependent on the extent of multimerization of SP-D and its ability to agglutinate the viral particles [18,30,33]. The enhancement of viral binding and uptake is accompanied by attachment of large aggregates of virus to the neutrophil, and the binding of IAV or SP-D-IAV aggregates is abrogated by pretreatment of the phagocyte with neuraminidase . Thus, viral internalization involves enhanced binding of the virus to sialylated glycoconjugate ligands on the neutrophil surface. SP-D also potentiates IAV-induced hydrogen peroxide responses in neutrophils, and protects neutrophils from IAV-induced inhibition of respiratory burst responses. Interestingly, SP-D does not increase the uptake of IAV by rat alveolar macrophages. Thus, there might be cell type specific effects of SP-D on phagocytic cells. Notably, human bronchoalveolar lavage (BAL) contains sufficient concentrations of SP-D to inhibit IAV HA activity in vitro, and depletion of SP-D from BAL reduces its HA inhibitory activity . SP-D can also interact with other respiratory viruses. For example, natural SP-D and a recombinant trimeric SP-D bind to the Rous sarcoma virus G protein in vitro and inhibit viral infectivity in vivo . These studies suggest that CRD-dependent binding, but not aggregation, is required to mediate the antiviral effect. In addition, bovine SP-D inhibits the infectivity of rotaviruses through calcium-dependent, mannose-inhibitable, attachment to the major viral envelope glycoprotein . SP-D can interact with host cells, both directly and indirectly. As indicated above, SP-D can enhance the phagocytosis and killing of certain microorganisms and enhance the oxidant response to microbial binding. However, at present there is only one study that suggests that the enhancement of phagocytosis by SP-D might involve the participation of an opsonic receptor. Furthermore, the enhanced uptake of IAV seems to be mediated by viral aggregation, with enhanced interactions of the virus with its natural receptors on the host cell. In any case, SP-D can interact directly with host cells, and in some cases can influence their behavior. SP-D is chemotactic and haptotactic for neutrophils and certain mononuclear phagocytes [59,67,68,69] and can elicit directional actin polymerization in alveolar macrophages . In this regard, SP-D is considerably more potent than SP-A. Early studies with natural proteins isolated from silicotic animals reported directed effects on the oxidant metabolism of isolated alveolar macrophages . However, such effects can probably be attributed to endotoxin contamination and/or aggregation. Purified dodecamers do not significantly increase the production of nitric oxide  or of proinflammatory cytokines such as tumor necrosis factor-α (Y Kesari, H Wang, A Mesika, E Crouch and I Ofek, unpublished data). Interestingly, purified SP-D has been reported to increase the production of several metalloproteinases in the absence of a significant effect on proinflammatory cytokine production . Despite the ability of SP-D to modulate a variety of cellular functions, little is currently known about potential cellular receptors for this protein. The uptake of mucoid strains of P. aeruginosa is decreased when macrophages are attached to slides coated with SP-D, in comparison with lysine-coated slides, suggesting the redistribution of a membrane receptor . In addition, SP-D is internalized by phagocytic cells and can be identified within phagolysosomal compartments , but it is unclear whether the uptake is receptor dependent and whether SP-D is being internalized in association with specific ligands. There are at least two classes of binding to host cells: CRD-dependent and CRD-independent. Some studies have demonstrated CRD-dependent binding to phagocytes that can be inhibited with EDTA or competing saccharides, both in vitro and in vivo. As indicated above, the ability of SP-D to elicit the chemotaxis of neutrophilic and monocytic cells depends on the lectin activity of SP-D . In addition, Kuan and coworkers reported that extracting formaldehyde-fixed alveolar macrophages with detergents largely eliminates the binding of purified SP-D, suggesting a membrane-associated ligand or glycolipid receptor . Dong and Wright have extended these findings and suggest that PI can contribute to SP-D binding by alveolar macrophages . It is of interest that SP-D can bind to recombinant sCD14 through interactions with N-linked oligosaccharides . Given that the membrane-associated form of CD14 is widely expressed on host cells, it is possible that CD14 can serve as a binding site on macrophages and other cell types. The phagocytic uptake of certain bacteria by neutrophils is also inhibited by calcium chelation or competing sugars ; however, this could result from the inhibition of microbial agglutination rather than lectin-dependent interactions with the phagocyte. Wang et al suggested that SP-D can bind to lymphocytic cells by a lectin-dependent mechanism . In this regard, it is interesting to note that glucosylceramide, a ligand for SP-D in vitro, is one of the most abundant neutral glycolipids expressed by lymphoid cells. Reid and co-workers were the first to present evidence for lectin-independent binding . These and other studies suggested that binding does not involve known C1q or collectin receptors. The only putative receptor protein, gp-340, is a widely expressed member of the scavenger receptor superfamily [77,78]. It binds to the CRD of SP-D in a calcium-dependent manner that does not require the lectin activity of SP-D. Although the protein has been immunolocalized to alveolar macrophage membranes and distributes together with SP-D in many different human tissues [10,77], it has not yet been shown to mediate the binding of SP-D to these cells or to participate in signal transduction events. The cDNAs isolated from lung have not shown a membrane-spanning region , and the protein is abundant as a soluble component in BAL. Given that gp-340 is a highly multimerized protein that contains numerous potential ligand binding domains (Fig. 1b), it is possible that the protein cooperates with SP-D in the neutralization or clearance of certain ligands rather than specifically mediating the interactions of SP-D with host cells. Wright and co-workers have demonstrated the binding of SP-D to isolated type II pneumocytes. The mechanism seems distinct from the binding to macrophages . The binding was dependent on concentration, time, and temperature and required calcium; it was not sensitive to protease treatment or to PI-phospholipase C. Although the internalized SP-D was degraded or recycled to lamellar bodies, SP-D binding did not alter the uptake of surfactant lipids. SP-D has demonstrated comparatively few direct effects on the metabolism of host cells, at least in situations where self-aggregation and endotoxin contamination have been excluded. One possible explanation is that modulation of cellular function requires the prior interaction of SP-D with a ligand. This would have numerous potential physiological advantages, because the presence of `active' protein might be restricted to sites of microbial or antigenic deposition. The binding of complex, multivalent, particulate antigens to two or more CRDs could markedly alter the conformation of SP-D molecules, with respect to the spatial orientation of the arms in relation to the N-terminal crosslinking domain and/or with respect to the spatial orientation of the CRDs within a given trimeric subunit. Thus, the `charging' of SP-D with a particulate ligand could lead to local or distant conformational changes that expose `cryptic' binding sites for cellular receptors. There is some preliminary evidence consistent with the notion that the interaction of SP-D with a ligand alters its capacity to activate host cells. For example, Ofek et al have examined the effects of SP-D, LPS, and LPS-coated latex beads on the production of nitric oxide by alveolar macrophage-like cells (I Ofek, A Mesika, M Kalina, Y Keisari, D Chang, D McGregor and EC Crouch, manuscript submitted). Under conditions in which SP-D, LPS, latex beads, or latex beads coated with SP-D or LPS were no more than minimally stimulatory, the opsonization of LPS-coated latex beads with SP-D resulted in a marked increase in NO production (I Ofek, A Mesika, M Kalina, Y Keisari, D Chang, D McGregor and EC Crouch, manuscript submitted). Although these effects can be abrogated with competing sugars, it is unclear whether the inhibitory effect of competing sugars involves the disruption of the interaction of SP-D with the ligand, the host cell, or both. All the effects could be secondary to altered presentation of the aggregated particles to receptors for the particulate ligand on the host cell. Thus, it is unclear whether one needs to invoke the participation of an SP-D receptor for many of its functions. It is well established that the binding of SP-D to IAV particles leads to aggregation-dependent enhancement of viral binding to neutrophils, with an increased oxidative response . These effects involve the natural receptors for the virus on the neutrophil. Significantly, the effects on neutrophil function are blocked by enzymic destruction of the sialic acid-binding sites for the HA on the neutrophil membrane , suggesting that the effects of SP-D do not require cellular recognition of the bound protein. Aggregation might also be important for mediating the interactions of neutrophils with some bacteria . Particle aggregation might be particularly important for other aspects of SP-D function. The relatively large spatial separation of CRDs seems highly suited to bridging interactions between particles with resultant aggregation, as demonstrated by experiments with IAV. Particle aggregation could similarly contribute to the metabolism of certain subfractions of surfactant lipid. For example, Poulain et al have shown that SP-D can mediate the formation of characteristic tubular configurations of lipid mixtures containing PI . Similar structures have been identified in association with type II cells in culture, and in alveolar proteinosis lavage. In addition, Persson et al demonstrated the aggregation of PI-containing liposomes . A variety of factors can modulate the lectin activity of SP-D in vitro and might influence SP-D activity in vivo. Selected examples are listed in Table 3 and discussed below. SP-D can be isolated in different multimeric forms from proteinosis lavage  and are produced by Chinese hamster ovary K1 cells transfected with human SP-D cDNA . As described previously, the effects of SP-D on the neutrophil response to influenza virus are highly dependent on the ability of SP-D to agglutinate the viral particles, and the agglutination activity is directly correlated with the extent of multimerization. Trimers can bind to the virus but have little capacity to modulate neutrophil interactions. By contrast, highly multimerized proteins show greater activity than dodecamers . Given these observations, factors that favor enhanced oligomerization or lead to the accumulation of trimeric subunits promote might influence SP-D function. For example, the liberation of active trimers by a hypothetical microbial protease could lead to the accumulation of molecules that might inhibit the aggregation-dependent activities of SP-D. In contrast, recombinant trimeric CRDs can stimulate chemotaxis  and decrease viral infectivity . 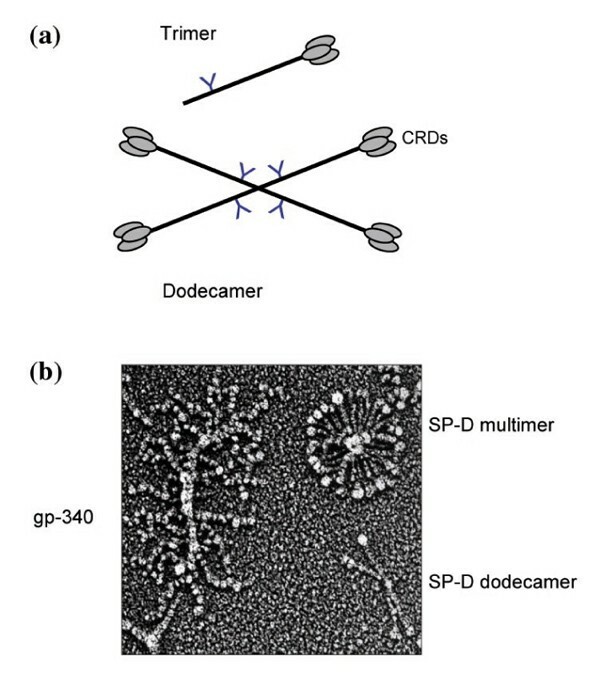 Although higher-order oligomers of SP-D can self-aggregate and precipitate in the presence of calcium in vitro, the functional consequences are not known. The lectin activity of SP-A is decreased after the nitric oxide-dependent nitration of tyrosine residues , and nitration decreases the ability of SP-A to enhance the adherence of Pneumocystis to alveolar macrophages . However, similar findings have not yet been reported for SP-D. Conditions of mildly acidic pH, as might be found in endocytic compartments, are predicted to disrupt the lectin-dependent activities of SP-D . Proteolytic degradation remains an important possibility. However, SP-D is highly resistant to degradation by a wide variety of neutral proteases in vitro, and degradation products have not yet been shown to accumulate under pathological conditions in vivo. Glucose concentrations at levels encountered in diabetes can interfere with SP-D's ability to interact with specific strains of IAV or other microorganisms in vitro . Many microorganisms release cell wall polysaccharides or glycoconjugates, which might interfere with the binding of collectins to the same or other organisms. In this regard, SP-D recovered from rats after the instillation of LPS into the airway shows decreased lectin activity, which is attributed to occupancy of the CRD with LPS . It seems reasonable to speculate that some organisms might compete with other organisms for binding to SP-D. Such a situation could conceivably predispose to secondary infections. Lastly, the potential inhibitory effects of competing saccharide ligands presents important methodological considerations for experiments using carbohydrate-containing cell culture medium or buffers. It is difficult to predict the functions of SP-D within the airspace. Other lectins with overlapping specificity are also present. Although the levels of mannose-binding lectin are probably low in the absence of increased vascular permeability, SP-A and the macrophage mannose receptor could conceivably interact with the same ligands in the distal airways and alveoli. Such interactions could lead to antagonistic or cooperative effects. Furthermore, we have little knowledge regarding the microanatomic distribution of these molecules in specific circumstances in vivo. Although most SP-A is probably associated with the insoluble phase of the alveolar lining material, and the macrophage mannose receptor is membrane-associated, the distribution might be altered in the setting of lung injury. Models of SP-D deficiency show no detectable anatomical or physiological abnormalities at birth. However, the animals gradually develop a patchy, subpleural alveolar lipidosis with associated type II cell hypertrophy, the accumulation of enlarged and foamy macrophages, and an apparent expansion of peribronchial lymphoid tissue [85,86]. Interestingly, the mice eventually develop distal-acinar emphysema and areas of subpleural fibrosis, which could reflect a continuing inflammatory reaction associated with abnormal oxidant metabolism and metalloproteinase activity . By contrast, SP-A-deficient mice (-/-) show essentially normal respiratory function and surfactant lipid metabolism [88,89] but numerous apparent host defense abnormalities . The capacity of SP-D to bind to specific strains of influenza A in vitro is highly correlated with the capacity of the virus to proliferate in mice in vivo . Specifically, strains with more oligosaccharide attachments on the HA are preferentially neutralized by SP-D in vitro and show decreased proliferation in mice. Because the administration of mannan together with the virus increased the replication of IAV in the lung, the involvement of a mannose-type, C-type lectin was implicated. SP-D-sensitive IAV strains also replicate to higher titers in the lungs of diabetic mice than in nondiabetic controls . Replication of the virus is positively correlated with blood glucose level, and decreases in response to insulin treatment. Significantly, blood glucose levels comparable to those measured in the diabetic mice were sufficient to inhibit the interaction of SP-D with these viral strains in vitro. PR-8, a strain that does not interact with SP-D but does interact with SP-A, replicated to the same extent in diabetic and control mice. SP-D levels increase in association with certain infections. For example, SP-D levels, but not the levels of serum mannose-binding lectin, increase markedly after IAV infection . Impressive increases in SP-D have also been observed in murine models of Pneumocystis carinii  and P. aeruginosa infection . SP-D-deficient mice have not yet been extensively characterized with respect to host defense function. However, they show decreased viral clearance and enhanced inflammation after challenge with respiratory syncytial virus  and IAV (AM Levine, personal communication). In addition, they show increased inflammation, increased oxidant production, and decreased macrophage phagocytosis in response to intratracheally instilled group B streptococcus and Haemophilus influenzae (AM Levine, personal communication). Although the overexpression of wild-type SP-D in type II pneumocytes with the SP-D-deficient mice can prevent the lipidosis and inflammatory changes , the ability of overexpressed wild-type SP-D or exogenous SP-D to ameliorate these abnormalities has not yet been described. The coexisting pulmonary abnormalities also complicate the interpretation of challenge models. For example, macrophage activation might enhance killing and offset any decrease that results more directly from SP-D deficiency. SP-D deficiency modifies the host response to instilled LPS with decreased lung injury and inflammatory cell recruitment . Molecules that can bind to potential antigens and deliver them to macrophages and other antigen-presenting cells might contribute to the development of acquired immunity. In this regard, a few published observations suggest possible roles in the development of humoral and/or cellular immunity in response to microorganisms or complex organic antigens. For example, SP-D can decrease interleukin-2-dependent T-lymphocyte proliferation . Interestingly, single-arm mutants were at least as potent as intact dodecamers in mediating this effect. SP-D also binds to oligosaccharides associated with dust mite allergen , and can inhibit the binding of specific IgE to these allergens, possibly through direct, CRD-dependent binding to lymphocytes . Thus, alterations in the level of SP-D (or the state of oligomerization) might influence the development of immunological responses and contribute to the pathogenesis of asthma and other hypersensitivity disorders. There are other potential interplays between humoral immunity and collectins with regard to antimicrobial host defense. For example, increased glycosylation of IAV coat proteins, an adaptation that is believed to help the virus to evade antibody-mediated neutralization, is associated with increased reactivity with SP-D and other collectins . Thus, the relative potential importance of antibody and col-lectin-mediated host defenses might be influenced by subtle variations in the structure of the microbial surface. There is little recent information on the developmental regulation of SP-D expression. In general, SP-D increases rapidly late in gestation [97–100]. The production of SP-D increases during the culture of fetal lung explants, and expression can be increased with glucocorticoids [98,100,101]. The exposure of fetal rats to glucocorticoids in vivo leads to precocious expression with increased numbers of SP-D-expressing cells and increased cellular levels of SP-D message [98,101,102]. Although SP-D is produced constitutively within the lung, protein accumulation and gene expression are inducible and increases in SP-D expression have been observed in a number of disease states or models (Tables 4 and 5). In general, the synthesis and secretion of SP-D increase in association with lung injury and activation of the respiratory epithelium . For example, levels of SP-D mRNA and SP-D accumulation are increased within 24-72h after intratracheal instillation of LPS , and SP-D expression by alveolar and bronchiolar epithelial cells increases after exposure of rats to 95% O2 for 12 h . Keratinocyte growth factor (KGF) increases SP-D expression and protein production in association with pneumocyte hyperplasia and after injury caused by bleomycin . In addition, the levels of SP-D can increase markedly in response to the overexpression of certain cytokines, such as interleukin-4, or in response to microbial challenge [91,92]. Studies of the upstream regulatory region of the SP-D gene have demonstrated increased promoter activity in the presence of glucocorticoids, which is consistent with the findings in vivo and in lung organ culture . However, no functional glucocorticoid response elements have been identified, and the effects of dexamethasone seem to be secondary and involve the effects of other transregulatory molecules. The activity of the human SP-D promoter is dependent on a conserved activator protein-1 (AP-1) element (-109) that binds to members of the fos and jun families of transcriptional factors . In addition, the promoter contains multiple functional binding sites for CCAAT-enhancer-binding protein (C/EBP) transcription factors. Mutagenesis experiments suggest that these are required for basal and stimulated promoter activity, and promoter activity is markedly increased in H441 cells after co-transfection with C/EBPβ cDNA (YC He and E crouch, unpublished data). The importance of the conserved AP-1 element and the presence of multiple binding sites for C/EBP transcription factors is consistent with the observed modulation of SP-D expression in the setting of tissue injury. SP-D promoter activity is not dependent on the binding of thyroid transcription factor 1 (TTF-1) . However, promoter activity is dependent on two interacting forkhead binding sites, upstream and downstream of the AP-1 element; these sites bind to hepatic nuclear factor-3α and apparently other forkhead box proteins in H441 lung adenocarcinoma nuclear extracts . Initial comparison of genomic and cDNA sequence suggested the existence of genetic polymorphisms in the SP-D coding sequence, including one in the N-terminal propeptide domain (Thr11 compared with Met11 in the mature protein) and three additional differences within the collagen domain at positions 102, 160, and 186 . The latter substitutions are conservative to the extent that they are not expected to disrupt the collagen helix. Floros and co-workers have recently confirmed the existence of polymorphisms at positions 11 and 160 of the mature protein . The potential biological significance, if any, is not known. Interestingly, the 50 kDa variant of SP-D showed O-linked glycosylation of Thr11 , suggesting that this polymorphism might be associated with altered glycosylation. Interestingly, the 50 kDa variant was recovered as trimeric subunits, raising the possibility that differences in the glycosylation of residue 11, which is immediately N-terminal to Cys15, could influence multimerization and the capacity of SP-D to participate in bridging interactions. There is increasing evidence that SP-D interacts specifically with a wide variety of respiratory pathogens, modulates the leukocyte response to these organisms, and participates in aspects of pulmonary immune and inflammatory regulation (Table 6). SP-D can influence the activity of phagocytes through CRD-dependent and CRD-independent interactions. At least some of the effects of SP-D result from aggregation with enhanced binding of the agglutinated ligand to their natural `receptors'. Although the lung is the major site of SP-D expression, it is likely that the protein has more generalized roles in host defense and the acute response to infection and tissue injury.